mytea@om: Tribute: Alton Ellis R.I.P. Another sad day in the music world as we hear the passing of probably the greatest ever singer in Jamaican music. 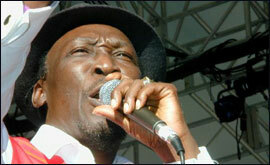 Reggae star Alton Ellis, known as "The Godfather Of Rocksteady", has died at the age of 68. The Jamaican-born singer, who moved to Britain in the 1970s, achieved fame with a number of hits, including "I'm Still in Love" and "I'm Just a Guy". He was a leading pioneer of the more laid-back "rocksteady" sound, which came out of Jamaica in the 1960`s. Ellis was still performing until August this year, when he collapsed after a concert in central London. His manager and agent Trish De Rosa described him as "my guiding star and my inspiration". "His life was the music and the stage," she said. "He was getting a tremendous amount of work right up to the end - it was very difficult to get him to slow down. "The Jamaican authorities are considering giving Ellis a state funeral, Ms De Rosa added. The prolific singer, who began his career in the 1950`s and fronted vocal group The Flames, was diagnosed with cancer in 2007. Ellis underwent chemotherapy before returning to the stage, but died in London's Hammersmith hospital on Friday night. He leaves more than 20 children!! !.